It was a sunny morning in August 2005 when Troy Newton opened the doors to his Main Street diner for the first time. Armed with a couple of frying pans and supported by his closest friends and family, he could never have guessed what was to begin that day or that his restaurant would grow into one of the most popular in the GTA. 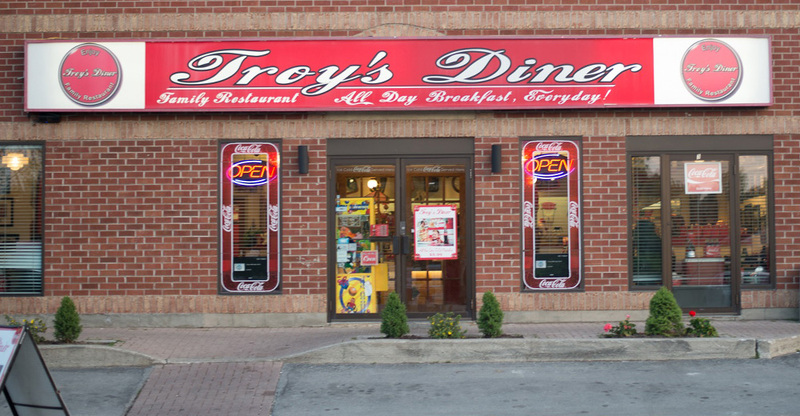 Troy’s Diner became the buzz of Milton and is still running stronger than ever. His open kitchen concept and unique “Coca Cola” red and white décor offers an element of entertainment that can’t be matched anywhere. The cracking of eggs, the buzz of a milkshake machine and the sizzle of a burger on the charbroiler are some of the sounds you will hear tableside while you soak in the visual extravaganza of trivia and memorabilia. Troy’s homestyle cooking, down to earth menu and courteous and friendly staff will make your visit an enjoyable one with a desire to return. Troy’s All-Day Breakfast Menu will hit the spot for you egg, pancake and omelette lovers. So come on down to Troy’s Diner, if not for the great food… just for the experience.